East Lothian likes to see itself as a cut above many other places. But one area where locals think it comes nearer the bottom of the league is in bus services. To some extent, this isn’t fair. The two main bus corridors in the West: through Musselburgh to Wallyford and Tranent and through Musselburgh to Prestonpans and Port Seton are so well served there are complaints about the number of buses clogging the High Street and Newbigging. It’s also possible to go anywhere in Edinburgh for £1.20. But outside this area the story’s very different. Why? It’s all down to deregulation, a Thatcher favourite that New Labour embraced as with so much else. Bus companies can run services and charge fares as they like. In big cities like Glasgow, competition might keep down fares and sharpen competition but in rural East Lothian, that’s a cruel joke. First runs the two main bus routes through the rural 80% of the county and, lacking competition, charge what they like: it’s over a fiver return from East Linton to Haddington. On vital routes they deem unprofitable, the council picks up the tab, which is where most of their £750,000 bus budget goes. Recently First got outrageous, cutting the Dunbar service to hourly, pulling it from the Brodie Road estates it served and running a fleet of tired coaches with steps so high even elderly and buggies can’t board, let alone disabled. Even if you can get on, it won’t take you to Tranent because the service is now ‘express’. Pencaitland and Ormiston are already up in arms for what they get charged to reach Tranent and now Elphinstone is to lose its weekend service and Port Seton its expresses. The result is that bus travel is getting a terrible name, which is unfair to Eve’s, Prentice and Perryman’s, small bus companies who all run excellent local services with council help. But should any of them try to compete with First, they would lose the ensuing bus war of cross-subsidised low fares and frequent service until they gave up. Then back to indifferent service with high fares. The only viable solution is to re-regulate buses and put them under local control. Then sensible ideas like transfers and day tickets—maybe even London-style Oyster swipe cards would make using buses so much faster, easier, better and thereby popular. Labour dickered for ten years then brought a half-baked bill that the last government dickered with too. If elected, I commit to putting s bus re-regulation bill among my top priorites. 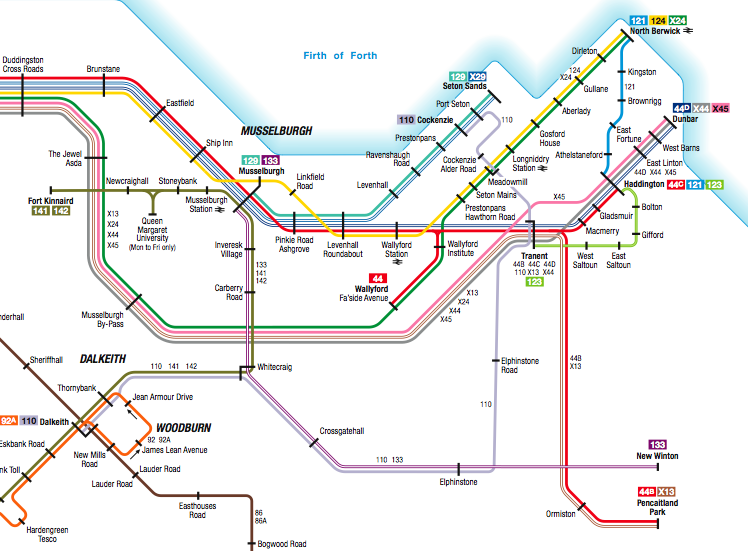 Firsts E. Lothian Route Map. Note how, as well as geography, they ignore all competition, including trains. This entry was posted in Transport and tagged bus; reregulation; public transport. Bookmark the permalink. Why did SNP MSPs join with the Tories in voting against the re-regulation of buses last year then? I dunno, Paul. Could it be that Charlie Gordon’s bill was unimplementable mince, largely framed around his own Glasgow experience and not much help to the struggling bus users of East Lothian and similar rural places? Just a wild guess. In my view Charlie Gordon’s Bill, although well intentioned, was not though through properly and could not be supported in the form in which it was presented. I also think the bus system needs to be regulated again, whether local authorities are the best vehicle in 2011 is debatable.